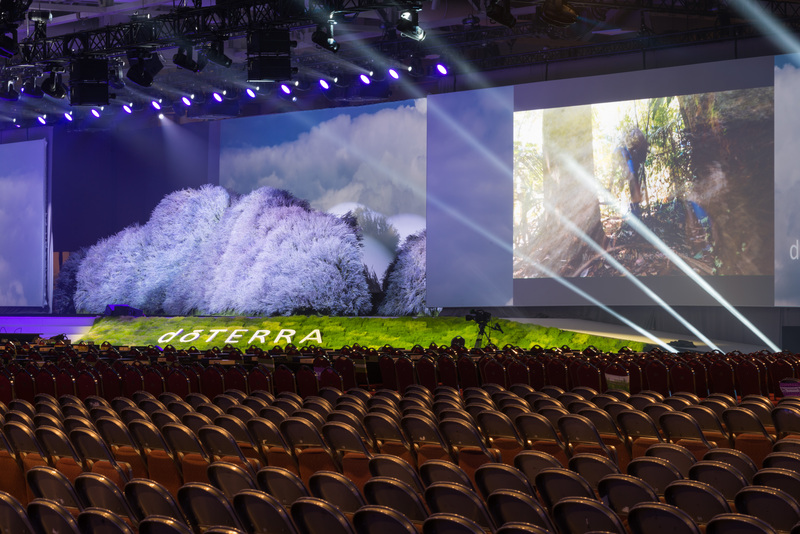 UVLD was invited by Webb Production to assist with lighting at the doTERRA Global Convention. The event took place September 6–9 2017 at the Salt Palace Convention Center in Salt Lake City, UT. doTERRA, a multi-level marketing company based in Utah, produces and distributes essential oils through more than three million independent distributors, also known as Wellness Advocates, around the world. 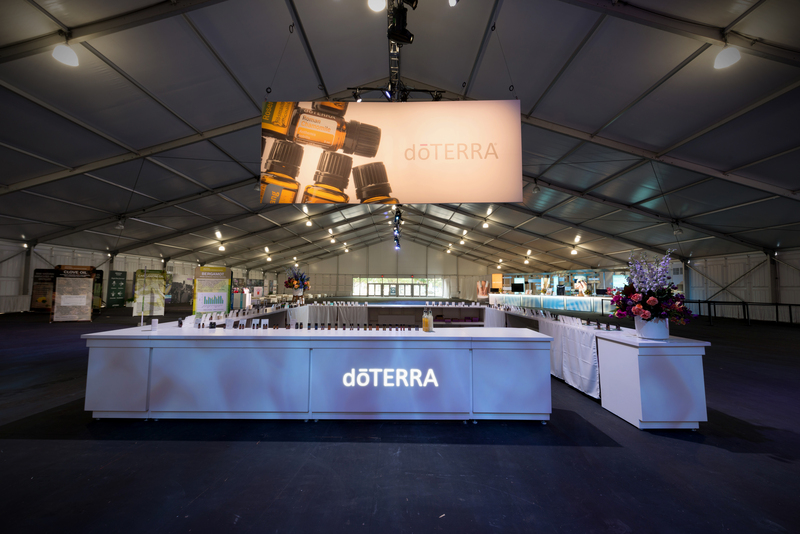 doTERRA’s annual Convention is the largest single-company convention to date in Utah. More than 30,500 essential oil enthusiasts from 68 countries gathered at the Salt Palace Convention Center for the event, with an estimated 10,000 additional viewers watching via live stream. UVLD’s David Rees and Jeff Nellis were tapped to provided lighting design for the Gala, which was held on night one of the Convention, and for the two massive General Sessions, with more than 8,000 people in attendance at each session. For the Gala, Webb Production covered the General Session set with an elaborate and elegant multi-layered fabric. “We lit the full-stage curved fabric in several layers,” Nellis said, “creating a warm, rich, dimensional background for the event.” Purple-carpet runways snaked through the audience area; as award-winning honorees walked these carpets to receive their accolades, the carpets were treated in pools of light and a fanfare of celebratory lighting. The night one festivities finished off with a many-piece band that rocked the room with music and dancing. The designers’ evening continued after the event concluded, with a grand push to change the venue and scenery, unveiling the General Session set for the following morning. “We had a few hours of programming time to mirror the duplicate General Session program that had been rehearsing for several days in Dave’s room next door and head straight into doors that morning,” Nellis said. The Showcase, designed by Paul Sharwell with Brad Criswell executing the onsite design, was held in two outdoor tents, each one being 525’ long and over 100’ wide. Michael Cone of Webb Production acted as ME for this space. The Showcase included 22 specific exhibits, five of which were more than 100’ long, as well an 8000-square -foot yoga studio. Design challenges included rigging/weight limits and appropriate lighting of the exhibits from limited positions. “Each tent had a 500’ truss high up in the center spine plus ground-supported positions as needed,” Sharwell said. One of the challenges that the onsite team faced was simply the amount of real estate they needed to cover in a short time. Nick Odencrantz served as the Executive Producer for Webb Production. For the General Sesssions, electricians Chris Nye and Dave Haar assistied Nellis, and Michelle Morin and Matt Burns assisted Rees. Gear included 44 Mac Vipers, 166 Mac Aura XBs, 24 Martin Rush PAR zooms and 138 ETC source-4 lekos, mostly provided by 4Wall Las Vegas.